I was a bit nervous it would be too spicy, but it wasn’t spicy it all. You could definitely taste the Cajun seasoning, but it wasn’t overbearing. If you wanted to wanted to make this a vegetarian dish, you could just take out the shrimp, and it would still be really really good. This is easily a restaurant quality dish, that I definitely recommend you try! Meanwhile, melt butter over medium heat in a large frying pan. Cook and stir mushrooms and shallot in butter until tender. Remove from pan. Add shrimp. Cook until shrimp turn pink about 2 to 3 minutes. Remove from pan. Add 2/3 cup chicken broth to pan, and bring to a boil. Cook, uncovered, until reduced to 1/4 cup (2 to 3 minutes). In a small bowl, stir together sour cream and cornstarch; mix in 1 cup chicken broth. Stir into reduced chicken broth in the frying pan. Cook and stir until thick and bubbly. Cook 1 minute more. 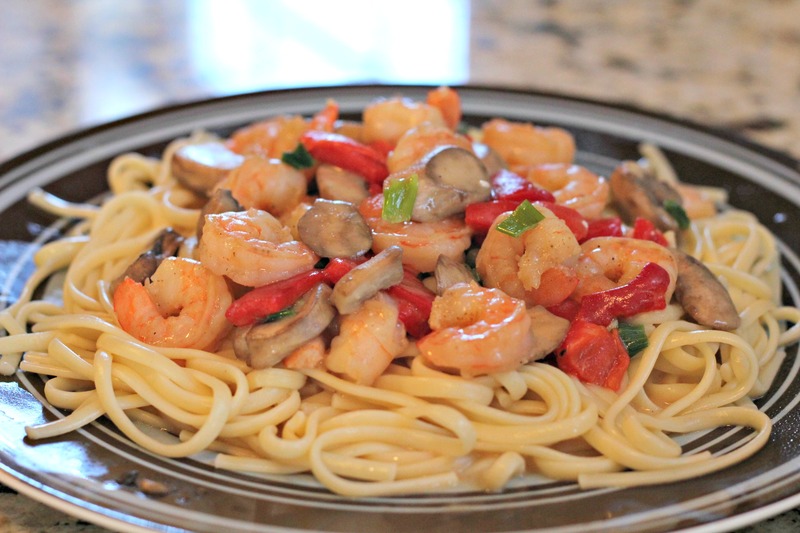 Stir in shrimp, mushroom mixture, roasted red peppers, and capers. Heat through, and season to taste. Serve over pasta. Your shrimp and pasta dish sounds very tasty. I love blackened anything and your recipe looks really terrific! Thanks! If you follow the recipe as-is, it’s not really spicy So if you really love those spicy blackened dishes you might want to go a little heavier on the Cajun seasoning!